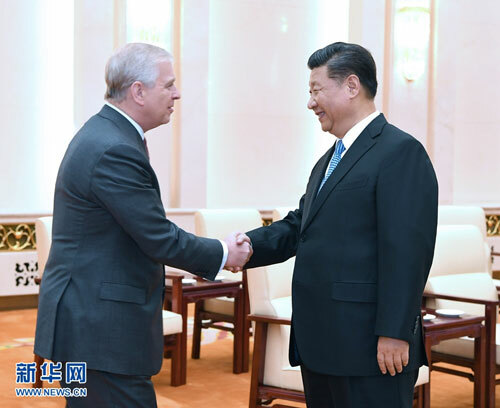 On May 29, 2018, President Xi Jinping met at the Great Hall of the People with Duke of York Prince Andrew of the United Kingdom (UK). Appreciating the positive efforts made by Prince Andrew and the royal family of the UK to enhance China-UK friendship, Xi Jinping pointed out that I paid a successful state visit to the UK in 2015, opening up the "Golden Era" of bilateral relations. Although the current international situation has changed a lot, the "Golden Era" of bilateral relations continues its steady and forward-looking development. Prime Minister Theresa May paid a successful visit to China at the beginning of this year, and bilateral cooperation in various fields maintains a sound development momentum. China is willing to, together with the UK, continue to intensify high-level mutual visits, and well hold institutional dialogues to ensure that bilateral relations will always enjoy sound, stable and forward-looking development along the right track. Xi Jinping stressed that in order to smoothly achieve the two centenary goals, China will adhere to the path of independent innovation with Chinese characteristics, and implement the strategy of innovation-driven development. China will stick to expanding opening up and enhance international cooperation in innovation. China-UK cooperation in strengthening scientific and technological innovation is conducive to realizing mutual benefit and win-win results, and will inject more new connotations into the "Golden Era" of bilateral relations. Andrew thanked Xi Jinping for meeting him and conveyed sincere greetings from Queen Elizabeth II to President Xi Jinping. Xi Jinping expressed his gratitude and asked Andrew to convey his warm greetings to Queen Elizabeth II. Andrew expressed that President Xi Jinping's successful state visit to the UK in 2015 vigorously advanced UK-China cooperation in a wide range of areas. The UK pays high attention to China's economic transition from high-speed growth to high-quality development. Andrew said he is willing to continuously devote to strengthening practical cooperation in such areas as science and technology, innovation and industry between the two countries, and enhance mutual understanding between the two peoples, so as to promote greater development of the "Golden Era" of the two countries. At the invitation of Chinese People's Institute of Foreign Affairs, Duke of York Prince Andrew visited China to attend the finals of the 2nd Pitch@Palace China, which focuses on scientific and technological innovation.